That little piece of flakey goodness is my idea of heaven. 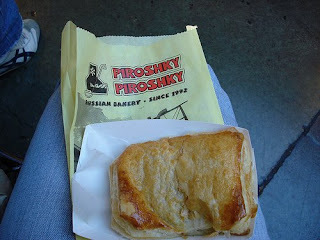 I was a piroshky virgin until lead and I went to Seattle this last January. And that is when we stumbled upon the renowned Piroshky Piroshky! I wanted to eat piroshkies for every meal but lead had to cut me off. Think Bourdain had this problem too. I wish our trip had been for more than a weekend so I could have sampled every flavor. I can't wait to taste how these little guys stack up to the piroshkies in Mother Russia.